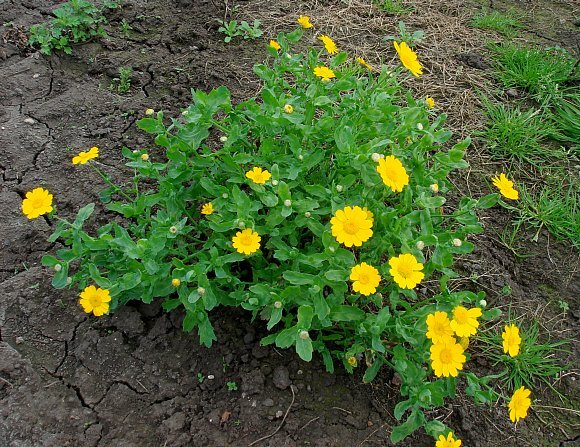 Bright yellow flowers, slightly glaucous leaves. Stem little-branched, about a foot tall. 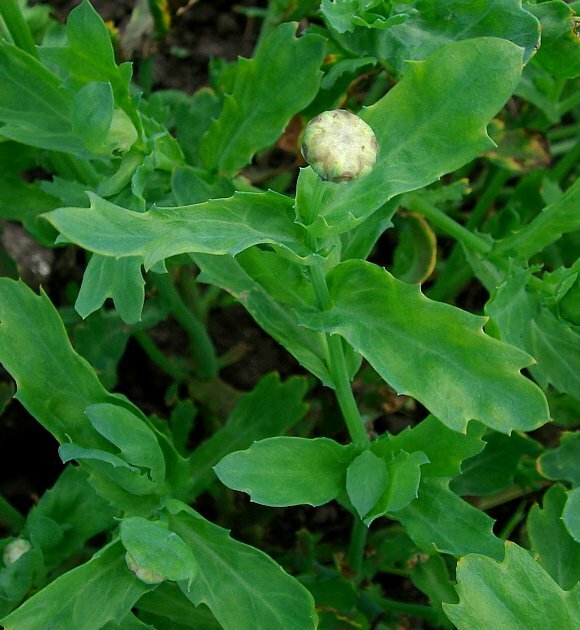 Un-opened flower-bud, Leaves un-evenly jaggedly toothed, clasping the stem. Petals ribbed and with one or two notches at the bluntish tips. 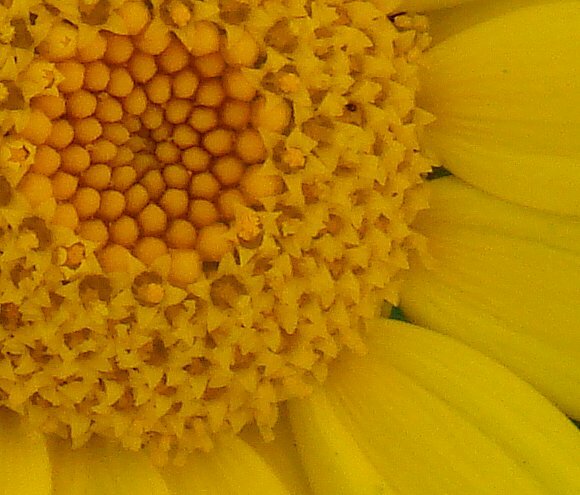 The bracts underneath the flower overlap each other. 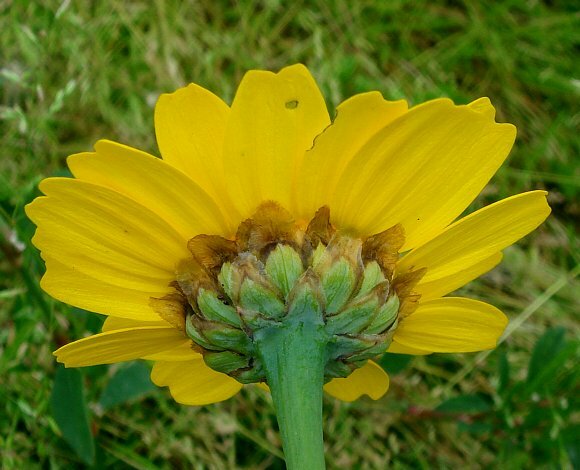 Both petals and central florets a deep yellow. 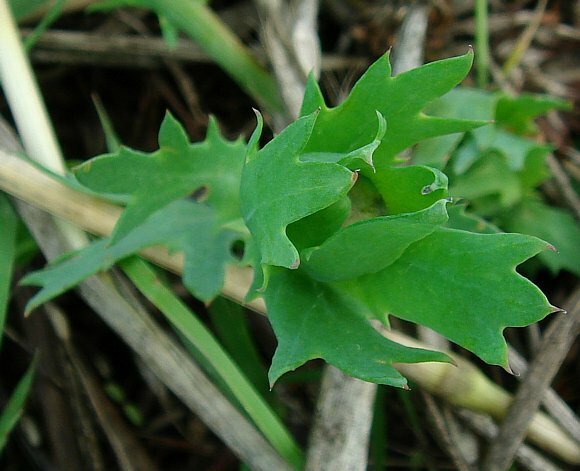 Some leaves jagged; all without stems. 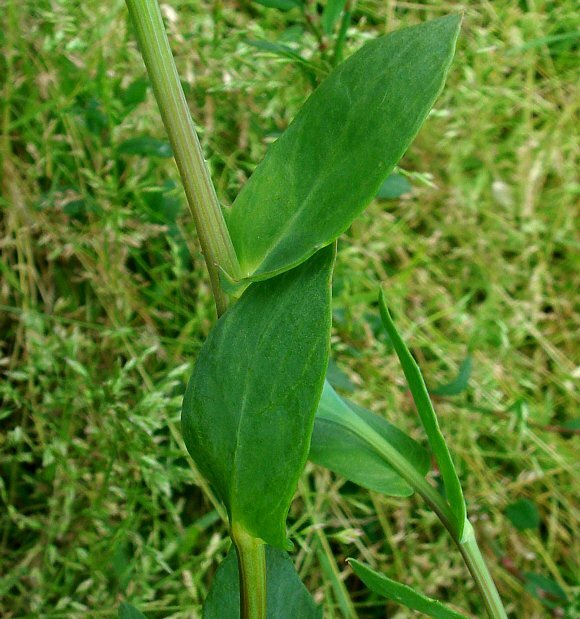 Lower leaves may be plain, privet-like, but still clasping the stem. 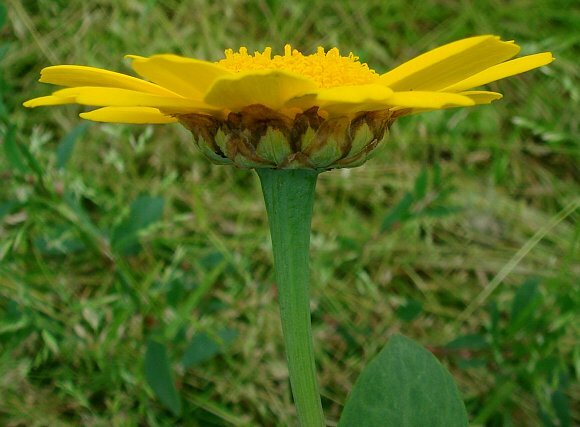 Some similarities to : Common Fleabane from afar, in that it has a similarly large-sized yellow composite flower. 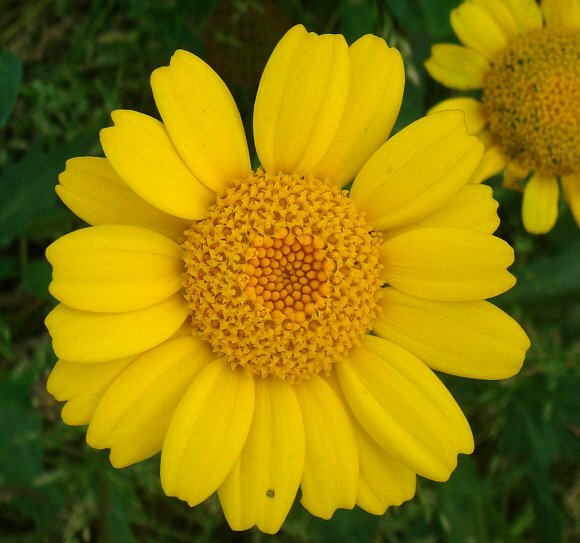 Previously, some books had this flower listed under the Genus Cyrysanthemum but it is not one of the true 'Chrysanthemums', which come from the Orient and are the familiar Florist's Chrysanthemums. 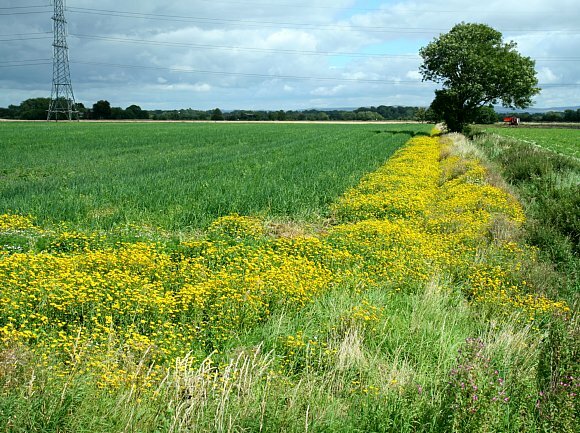 Possessing natural insecticidal properties Corn Marigold was sometimes planted (or allowed to grow) near or within crop plants on farmland in order to keep pests at bay without recourse to modern insecticides (which may not have been as effective in past times). 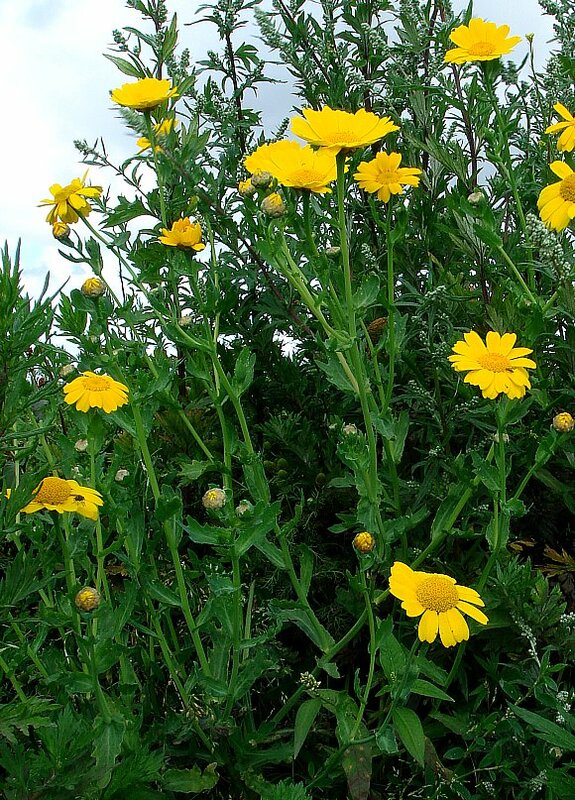 Corn Marigold can be an invasive weed in some areas of the World. 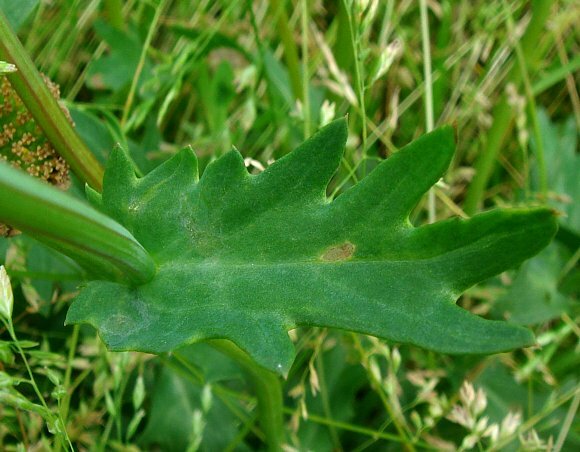 The above photographs show its potential in over-riding crop plants in Lancashire. 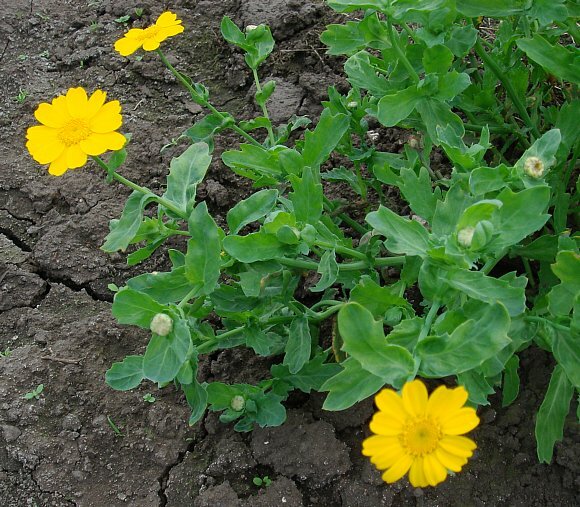 The yellow colour of the petals of most plants is due to the presence of carotenoids, but not in the case of Corn Marigold, where it is due to the presence of the 7-glucoside of Quercetin and particularly of the 7-glucoside of Gossypetin called Gossypitrin. 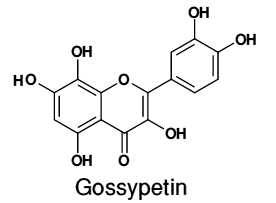 Gossypetin is a flavonol and yellow dye which also exhibits strong anti-bacterial properties. 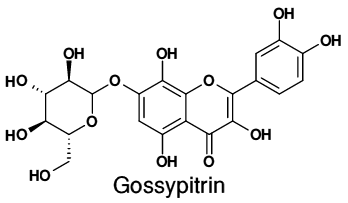 Gossypitrin is also yellow contributing more to the colour of the petals than does Gossypetin.